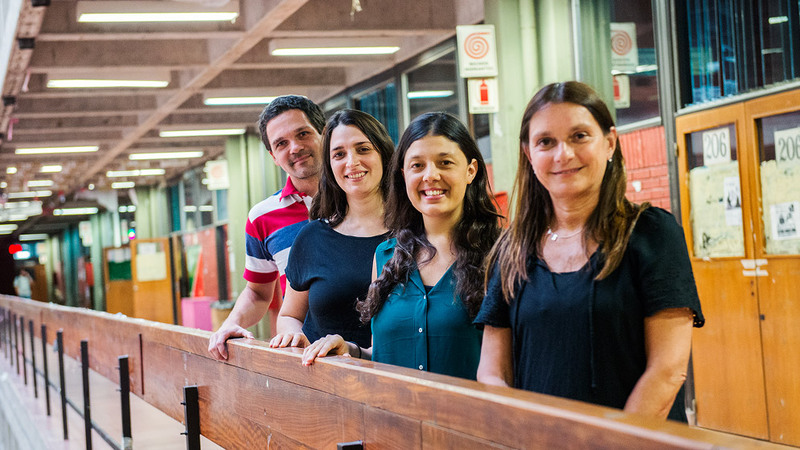 CONICET and UBA researchers participated in an international project that aims at assessing the consequences for developing countries. Ramiro Saurral. Natalia Montroull, Carla Gulizia and Inés Camilloni. Photo: CONICET Photography Verónica Tello. Solar Radiation Management (SRM) is a methodology at the experimental stage that aims at reducing the temperature of the atmosphere –thus fighting global warming– by blocking part of the solar energy that reaches the Earth through particle spreading like volcanic ash. In order to understand which can be the consequences of using this type of technology on the undeveloped world –most vulnerable to the effects of global warming and climate change–, eight groups of scientists from different developing countries (Argentina, Jamaica, Costa de Marfil, South Africa, Benin, Bangladesh, Iran, Indonesia) participate in an international project. In Argentina, the team in charge of assessing potential local and regional impact is led by Inés Camilloni, CONICET independent researcher at the Sea and Atmosphere Research Center (CIMA, CONICET-UBA). Its mission is to analyze the possible effects on the water cycles of Cuenca del Plata and the rivers that comprise it. “Through computer simulation, we seek to know which can be the climatic consequences for the region if we inject volcanic type particles in the atmosphere by the use of aerosols to reduce solar radiation levels. We want to know what is going to happen with temperature and precipitations. That information will allow us to feed the hydrological model to observe the changes of the rivers flow of Cuenca del Plata in general and during extreme climatic phenomena like floods”, Camilloni explains. Although the projects to intervene deliberately the climate are led by developed countries, the consequences would be global. For this reason, this is important for the so called developing countries, where the climate change has larger impact. “That information is relevant for countries like ours because the debate will focus on subjects like who will be responsible for deciding the amount of particles to be injected and where. These issues are related to the governance of climatic matters. In these debates, it is necessary to have representatives well informed so as to support their view with scientific bases”, the researcher explains. The finance of the project depends on the recently created DECIMALS Foundation (Developing Country Impacts Modelling Analysis for SRM), which aims at providing knowledge on SRM impact on developing countries through computer models. Apart from obtaining data and publish it in specialized magazines, the idea is to disseminate it through different channels to reach those who are responsible for making decisions as well as society in general. “SRM is controversial technology because it implies to continue the intervention on the climate without knowing all consequences. On the other hand, it is a resource that can be considered as a way of not slowing so fast Carbon-Dioxide release to the atmosphere as a central strategy to decrease the temperature of the atmosphere. From that point of view, it is also contentious”, Camilloni concludes. Ramiro Saurral: Associate researcher. CIMA. Carla Gulizia: Assistant researcher. CIMA. Natalia Montroull: Assistant researcher. CIMA.